What better way to indulge in summer than with a top notch slice of progressive trance. 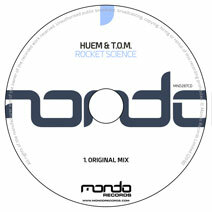 We welcome newcomers Huem & T.O.M. to the label with their debut release 'Rocket Science'. The duo instantly caught our attention with this lush little number thanks to its killer groove and bass line. We particularly love the breakdown thanks to its lush piano chords, plucky stabs and warm atmosphere which builds the energy to the max ready for the drop which takes your breath away.